Off the beaten path in Mendenhall, Miss. sits an enchanting treehouse that looks as if it came straight out of a fairytale. 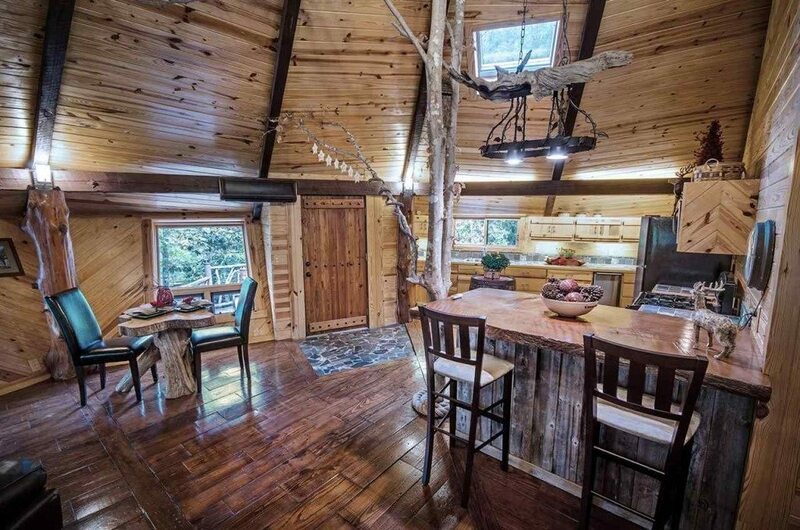 The treehouse was built back in 1971 by artist Johnny Knight as a getaway home for his family. Knight had no prior experience in architecture before he cleared the land around two tree stumps. Atop of them is where he built an octagonal shaped treehouse. The quirky exterior design is intriguing, but does no justice to what you'll find inside. A large open space welcomes those who enter. The space breaks up into all the necessary rooms a family needs in a retreat. There is a bedroom, a kitchen, a dining area and a living room. High, vaulted ceilings really open up the inside living space. The tongue and groove ceilings add texture to the overall feel of the layout. A tree inspired dining table, unique wood railings up above combined with wooden plank flooring really bring out the character of the home. In addition to the main living area Knight added in one little surprise. Opposite the front door guests will find a wooden ladder to climb their way up to an open loft area. This area is perfect for a study or additional sleeping space. Knight also gave his guests a nice place to enjoy the view of his 4.5-acre property. A walking bridge connects two generously sized decks. Being built up on tree stumps also gives an area large enough to escape to on rainy nights you may still want to enjoy the fresh air. When Knight died in 2003 the treehouse sold. A few years later the treehouse sold again. This time back to someone in the Knight family. Family members can once again enjoy Knight's masterpiece. The public has also been able to enjoy the treehouse. Events such as engagement shoots and weddings can take place here. Though the pictures tell a wonderful story this treehouse seems as if this is one place you truly need to see in person to believe.